Boyle goes to the break room to get the squad's views on his Halloween costume. Boyle showcases the options so the squad can pick, but their responses to his different costumes are of no help at all. Later, Jake waits at his desk as the Captain arrives for work. Jake approaches Captain Holt to ask if he knows it's Halloween. When Jake wagers he can steal the Captain's watch before midnight, Captain Holt is seemingly uninterested in staging another round of their Halloween challenge, until Jake ups the ante by quintupling the amount of overtime he'll do if he loses the bet. Captain Holt accepts the challenge. Meanwhile, Terry asks for Amy, Rosa and Gina's help in the squad's Safer Halloween program to screen candy. Gina bails out claiming she has an urgent matter to attend to. Jake gathers the rest of the squad, minus Captain Holt, in the briefing room to talk through the plan for the Halloween challenge. Jake has given them each in a role in a plan he's worked on for months. Jake brings in a notorious pick pocketer, Dan "Fingers" McCreary, to grab the Captain's watch while the squad distracts him. Jake goes to Captain Holt's office to invite him to enjoy a night at the opera. When Captain Holt declines, Jake brings the opera to him and has Scully begin singing. After Sergeant Jeffords breaks Captain Holt's door lock off, Rosa throws a smoke bomb in to root Holt out of the his office. When the Captain enters the precinct, Boyle drops a load of rubber balls from the ceiling, while Jake flies a drone at the Captain, which hits a man in the back. An angry Holt helps the man, who happens to be "Fingers", up, at which point he steals Holt's watch and replaces it with a fake. After Holt admonishes Jake for taking the challenge too far and walks out, Jake celebrates being on course to win the bet. Jake and Boyle go to a bar to pick up the watch which McCreary left with the bartender. When Jake opens the package left by McCreary, it contains a note saying he took the watch. Jake and Boyle return to the precinct to try locate McCreary. Holt asks Jake to put the wager on hold for ten minutes as his husband, Kevin, is coming to have a quick dinner with him and the watch is of great sentimental value to Kevin. Meanwhile, Terry, Rosa and Amy are handing out inspected candy to kids. When Gina arrives, she says she can't stay long as her dance troupe is performing tonight. Terry is angry that Gina's urgent matter is her dance hobby. Jake and Boyle drive to an alleyway where McCreary wants to meet them. When they hand over money and Jake's shoes to McCreary, he tells them they had the watch all along as he delivered it to the glove compartment of Jake's car. When Jake and Boyle turn around to leave, they see Jake's car being towed as it was parked in front of a fire hydrant. Jake and Boyle chase after the tow truck in a shopping trolley, but they can't keep up. As Jake and Boyle run down the street, a group of drunks dressed in bear costumes split them up, at which point Boyle disappears from sight. Boyle shouts to Jake that there's a party bus, which Jake gets on and commands the driver to go to the impound lot. During the twelve-block journey, Jake dances with some of the party-goers. Elsewhere, when Terry goes to talk to Gina, she tells him she was kicked out of her dance troupe, Floorgasm. Gina explains she's being going to college at night and so she'd missed the last eight rehearsals. When Gina says she'll never dance again, Terry tells her he'll dance with her tonight. At the impound lot, Jake is unable to collect his car as his wallet and badge have been stolen. When Jake climbs over the fence and approaches his car, it's grabbed by the mechanical hand for destruction. Police officers then arrive to arrest Jake. 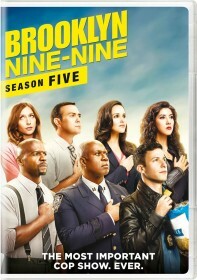 Back at the precinct, Jake is shackled in the interrogation room when Captain Holt enters. When Jake explains how the challenge to get Holt's watch landed him in jail, the Captain says he has had the watch all night long. Jake tells him that's just the fake watch, but Holt removes the decoy from his pocket. Jake realizes Holt was behind all this and played him, in Holt's words, like "Franz Bluheim plays the flute". Captain Holt explains he's been planning it for a year, ever since he lost their last Halloween bet. Holt tells Jake how he influenced Jake to select the watch as his target and how he employed Dan "Fingers" McCreary when he was arrested by Rosa. Captain Holt goes on to tell Jake how the rest of the squad were secretly working for him and all played a part in the challenge. Amy placed a fire hydrant by Jake's car and then towed it away. The drunk bears who split Jake and Boyle up were Hitchcock and Scully. Terry kidnapped Boyle so he couldn't help Jake. Rosa was on the party bus, distracting Jake with her dancing, while Holt was in costume and stole Jake's badge. Captain Holt reveals the rest of the squad watching from behind the interrogation window, ready to witness Jake admit that Captain Holt is an amazing police captain/genius. Later, at a bar where Floorgasm are performing, Terry tells Gina he talked to Captain Holt and they will find a way to support Gina so she can pursue her dancing and school. Gina and Terry then take the stage to dance.